With the award for best overall supplier performance, Airbus Helicopters honors Rohde & Schwarz for many years of successful cooperation. 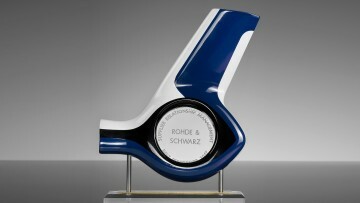 The Supplier Relationship Management Award stands for special satisfaction with Rohde & Schwarz as a partner. Martin Schübel, Executive Vice President Procurement at Airbus Helicopters, said succinctly on presentation of the award at Helitech in Amsterdam: “With Rohde & Schwarz, the overall package is just right.” Along with overall performance, very high scores for on-time delivery (OTD) and on-time quality (OTQ) were key considerations. Furthermore, the especially good support – flexible, fast and competent – is appreciated, in particular during the radio integration phase. Stefan Pleyer, Vice President Market Segment Avionics at Rohde & Schwarz, adds, “Being valued as the most reliable and supportive partner makes us proud. This achievement is the result of a long and trustful cooperation by our companies from end to end, including production, technical support and service.” Rohde & Schwarz has been a supplier to Airbus Helicopters for many years. The airborne transceivers are deployed on a large number of Airbus platforms. The software defined radios of the Munich based specialist for secure communications satisfy the highest security standards, enable network centric operations and ensure interoperability between all branches of the armed forces and between allied nations. Almost 8000 software defined radios from the R&S M3AR airborne transceiver family are in use worldwide on over 70 different airborne platforms. The latest member of the Rohde & Schwarz family of airborne radios, the R&S SDAR, is another excellent choice for avionic communications solutions. This high-end radio offers secure, high data rate communications and flexible deployment. It delivers unprecedented efficiency in terms of logistics, integration, maintenance and training. It simplifies integration and saves space and weight in the aircraft. Rohde & Schwarz, an independent European company, is the only vendor with a military airborne radio that meets the civil certification regulations of the European Aviation Safety Agency (EASA). Military aircraft can only be certified and deployed without restrictions if they meet both military and civil standards.